Since the completion of a degree in Fashion and Textile Design at Leicester Polytechnic I have been working as a freelance artist. 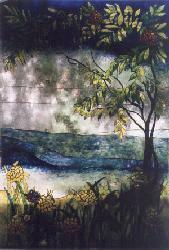 My work has gone through many changes from designs for interior fabrics to paintings, cushions, greetings cards, glass and mirrors. I spent an initial three months working in a studio with other artists and from then on I began working part-time framing pictures whilst continuing to develop my work from home. In Leicester as of 1992, I exhibited my work within a number of venues including, the Haymarket Theatre in 1994, the City Gallery in 1994 and the Merrin Gallery in 1995. In 1994 I spent a year studying a PGCE in Art and Drama at Oxford whilst teaching part-time in Hertfordshire. I exhibited at the Loft Gallery, Stanstead Abbots and Letchworth Museum in May 1996, the Mill Foyer Gallery, Spiceball Park, Banbury in June 1996. I was involved in the Herfordshire Open Studios exhibition during September 1997 and displayed a selection of my my work at the Pendley Court Theatre, Tring and the Bull Gallery, Barnet. I am currently exhibiting at the Buglass Gallery, Little Houghton, Northants and am having a solo exhibition between 22nd Feb and 21st March 1998 at the Derngate Theatre, Northants. 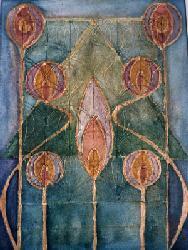 The theme of my work is abstract, derived from natural sources as well as Art Nouveau influences. My paintings are essentially inks and enamel paints on canvas, whilst my glass pieces are all hand-coloured and the lanterns and mirrors are copper-foiled. 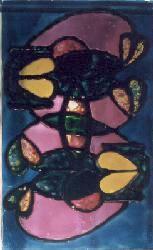 Presently I teach part-time in Northamptonshire and will be running an adult stained-glass course at the Bull Gallery, Barnet as of Jan 18th 1998 every Sunday.